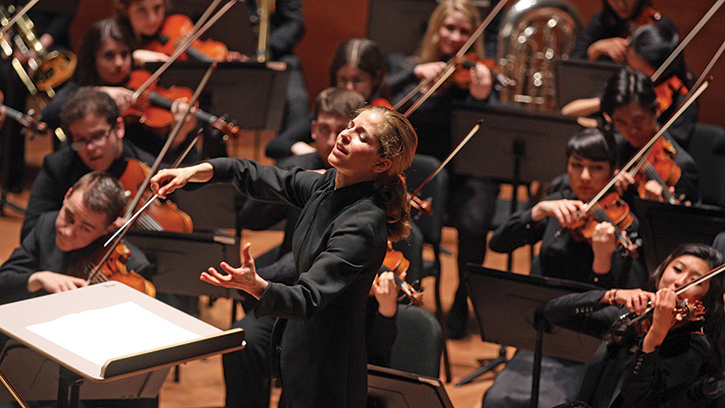 One of today’s most sought-after conductors, Karina Canellakis makes her Seattle Symphony debut with Prokofiev’s Romeo and Juliet Suite on May 17 & 20. When Karina Canellakis was only a few months into her first season as the assistant conductor for the Dallas Symphony Orchestra, she got one of those rare, big breaks that can launch a young conductor’s career. At the last minute, she stepped in for the orchestra’s music director, Jaap van Zweden, to lead Shostakovich’s Symphony No. 8 — without a single rehearsal. Her performance made headlines in 2014, and now, four years later, she has been named the next chief conductor of the Netherlands Radio Philharmonic Orchestra. Next week, she makes her Seattle Symphony debut on May 17 & 20 conducting Prokofiev’s Romeo and Juliet Suite and Haydn’s Cello Concerto in D major with Seattle Symphony Principal Cellist Efe Baltacıgil. Canellakis fondly remembers the first time she performed Prokofiev’s Romeo and Juliet Suite as a violin student at the Curtis Institute of Music in Philadelphia with Russian conductor Yuri Termirkanov. “He didn’t speak in the rehearsal, only showed us with mime-like gestures what the character was and how to play,” she recalls. At her concerts with the Seattle Symphony, Canellakis will also conduct Dvořák’s rarely performed orchestral tone poem, The Wild Dove, and Haydn’s Cello Concerto in D major with Seattle Symphony Principal Cello Efe Baltacıgil as the soloist. Experience Prokofiev’s Romeo and Juliet with Karina Canellakis and the Seattle Symphony on May 17 & 20! Karina Canellakis’ performances are generously underwritten by Eric and Margaret Rothchild. Efe Baltacıgil’s performances are generously underwritten by Patricia and Jon Rosen.